Blend of Cinsault, Syrah & Carignan. Dark garnet in color with scarlet highlights, this is one juicy mouthful and a quintessential French table wine. Earthy/funky on the nose initially, with exotic spice, green & black pepper and hints of wild violets. Luscious and lean blackberry fruit and dark berry undertones on the palate. Later, underlying briar calms down and gets down. Herbaceous, like bay leaf. Unctuous hints of fig on nose resolve ultimately and utterly lean and quaffable. This completely natural and authentic wine comes from Domaine Benjamin Taillandier, located in Caunes-Minervois, situated between the ancient city of Carcassone and the Massif Central. Southern exposure and Mediterranean oceanic influences, along with protection by les Montagnes Noir from cold winds make for unique locale. Minervois takes its name from the fortified village of Minerve, built by the Romans and reportedly dedicated to the goddess of wisdom. The region was recognized as AOC in 1985. Diverse soil includes schist, sand, clay and limestone. While Benjamin had technical training at winemaking school and worked in conventional wineries, his greatest influence was working alongside natural winemaker Jean-Baptiste Senat, with ideas and techniques that inspired and shaped his current practices in his present Domaine. Grapes are farmed organically and biodynamically, harvested by hand (1-2 weeks before other producers). Short vinification, aged 6 months in stainless steel. Only natural yeasts. 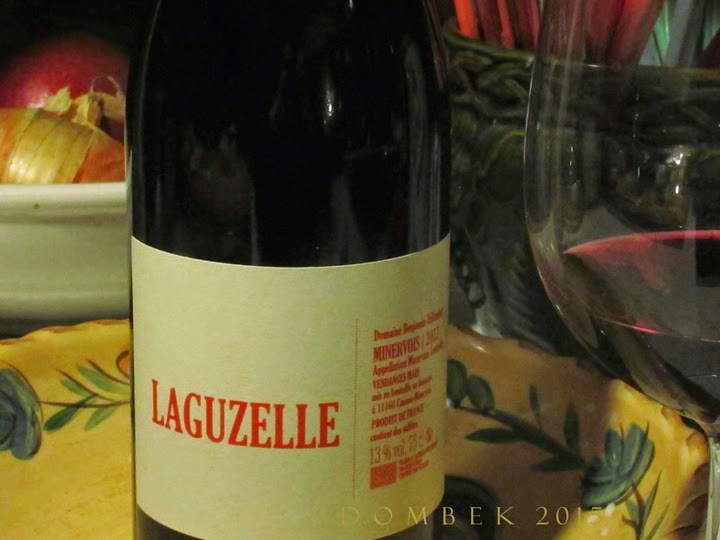 Laguzelle Minervois is one lively wine, with much character. Other favorites of mine from Dom. Benjamin Taillandier include VITI VINI BIBI and BUFENTIS. If you happen to be in Caunes-Minervois, stop by Cantine du Curé, his terrific wine bar downtown ... open during the summer season. Here in Portland, ME, we are fortunate to know these wines through Zev Rovine Selections, Brooklyn, NY, Imported by Fruit of the Vines, Long Island City, NY and Distributor Devenish Wines, Portland, ME. Also carried by new Natural Wine Shop, Maine & Loire, Washington Ave; Rosemont Market, Brighton Ave; RSVP, Forest Ave; Aurora Provisions, Pine St, Portland and Oak Hill Beverage, Scarborough. Gloomy cranberry in color with red highlights, this is one has delicious taste and a quintessential French table wine. This is very informative. Thank you for sharing.